Objectives: Prospective renal donors are a select population of healthy individuals who have been thoroughly screened for significant comorbidities before they undergo multidetector computed tomo­graphy. Our aim was to determine the prevalence of incidental findings on preoperative multidetector computed tomography in a healthy cohort of potential living donors for kidney transplant. Materials and Methods: A prospective study was performed of prospective living kidney transplant donors at a national kidney transplant center. Study inclusion criteria were all potential kidney donors who underwent multidetector computed tomography during the living-donor assessment process over a 5-year period (January 2012 to 2017). Results: Our cohort included 375 potential living donors who had multidetector computed tomo­graphy; mean age was 44.33 years (range, 21-71.5 y). In total, there were 228 incidental findings identified in 158 individuals. Of the 375 potential donors, 193 (51%) proceeded to living donor nephrectomy. 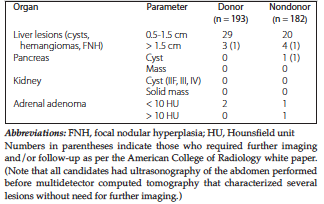 On multidetector computed tomography, 97 incidental findings were identified in the donor cohort versus 131 in the cohort that did not proceed to donation. Bosniak 1 renal cysts were the most common incidental finding (n = 46) followed by liver cysts < 1.5 cm (n = 42) and urinary tract calculi (n = 21). There was 1 incidentally detected pathologically proven malignancy. Conclusions: A variety of incidentally detected lesions of moderate to high importance were detected in this healthy donor cohort. Individuals undergoing assessment with multidetector computed tomography for living donor nephrectomy should be counseled on medical, financial, and psychological implications of incidentally detected lesions during the kidney transplant evaluation process. The study was performed on all potential pro­spective living kidney transplant donors in a national kidney transplant center (Beaumont Hospital, Dublin, Ireland). Study inclusion criteria were all potential kidney donors who underwent MDCT during the living-donor assessment process over a 5-year period (January 2012 to January 2017). Exclusion criteria were potential living donors who did not proceed to MDCT. Our study aimed to quantify the nature and incidence of incidental findings on MDCT for renal donor assessment and assess its impact on a national renal transplant service. This information can potentially be used to counsel donors regarding this potential source of harm in advance of renal donor assessment. The first stage comprises an initial telephone assessment by a transplant coordinator to rule out an absolute contraindication to donor nephrectomy. Absolute contraindications to living donor neph­rectomy are provided in Table 1. If no absolute contraindications are identified, donors then undergo an immunologic assessment of donor-specific antibodies and virtual cross-match against the potential recipient. Potential living donors are assessed by a multidisciplinary team that includes nephrologists, transplant surgeons, immunologists, radiologists, social workers, and psychiatrists (if indicated). All donors are evaluated with blood, urine, and radiologic investigations. Imaging modalities include chest radiography, abdominal ultrasonography (US), and radioisotope renography to estimate glomerular filtration rate. If the tests deem that the individual is a reasonable candidate for donation, the candidate will then undergo abdominal MDCT to accurately characterize the renal anatomy and vasculature before elective donation. Once the potential living donor and recipient have satisfactorily completed stage 2, a decision is made to proceed to transplant. The final stage of the assessment consists of a final immunologic and medical assessment 1 week before the prospective living donor transplant. In our institution, a low-dose noncontrast CT followed by a combined arterial and urographic phase study is performed. Computed tomography scans are performed using a 16-slice MDCT scanner (Sensation 16, Siemens Healthcare, Deerfield, IL, USA) or a 128-slice MDCT scanner (Phillips 128, Phillips Healthcare, Bothwell, WA, USA). For the procedure, a low-dose noncontrast CT at 100 mA from the xiphisternum to the pubic symphysis is first performed to primarily evaluate for stone disease. Next, 50 mL of iopamidol (Niopam 300) are manually injected into a peripheral intravenous catheter to provide contrast opacification of the urinary tracts when excreted, which is followed by 100 mL of iopamidol (Niopam 370) pump-injected at 5 mL/s after a further 10 minutes. This is bolus tracked when triggered images are acquired from the xiphisternum to the pubic symphysis. This results in a combined study of the arterial system from the pump injection of contrast and of the urinary system from the hand contrast injection 10 minutes previously. All image data are reconstructed with a body soft-tissue algorithm in 1-mm-thick and 3-mm-thick sections. All CT angiograms are interpreted in axial, sagittal, and coronal reformations. Of the 375 potential living donors who proceeded to MDCT, 186 (50%) were female. The mean age of the prospective living-donor cohort was 44.33 years (range, 21-71.5 y). In total, there were 228 incidental findings on MDCT assessment in 158 subjects. Of the 375 potential donors undergoing MDCT, 193 (51%) proceeded to living donor nephrectomy. The remaining 182 individuals (49%) comprised the nondonor cohort. 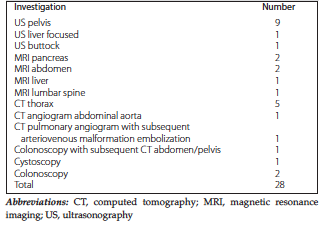 Table 2 stratifies incidental findings per the American College of Radiology white paper on managing incidental findings on abdominal CT.8 On MDCT, 97 incidental findings were identified in the donor cohort versus 131 in the nondonor cohort. Overall, 158 potential candidates (42%) had an incidental finding. Bosniak 1 renal cysts were the most common incidental finding (n = 46) followed by liver cysts < 1.5 cm (n = 42) and urinary tract calculi (n = 21) (Table 3). On MDCT, gallstones were identified in 7 individuals. Four adrenal adenomas were also identified, 3 of which were characterized on CT and 1 which was lipid-poor and required MRI for assessment. In 186 potential female donors, fibroids were the most common gynecologic finding identified (n = 12), followed by complex adnexal cysts (n = 4) and adnexal dermoids (n = 2). Table 3 lists all incidental findings (including those not detailed as per the American College of Radiology white paper8). There was 1 incidentally detected pathologically proven malignancy in a potential donor (3-cm mass at the base of the urinary bladder). This candidate underwent transurethral resection of the mass and was subsequently diagnosed with a superficial urothelial carcinoma (pTaG1). The overall prevalence of malignancy was 0.3% (1/375). Postoperative surveillance with cystoscopy has so far been negative for tumor recurrence. In our prospective donor population, 28 individuals (7.5%) had incidental findings requiring follow-up investigation (Table 4). Eleven individuals underwent further US scans, with the most common being assessment of the female pelvis in 9 individuals. Four individuals have remained under US follow-up for complex adnexal cysts. Six candidates required MRIs, with 5 for visceral abnormalities that were subsequently characterized as benign entities. These included focal nodular hyperplasia in the liver, a retroperitoneal cyst, focal pancreatic fat, pancreatic cysts and an adrenal adenoma, and a lumbar spine finding that was characterized as an atypical hemangioma. Imaging of the lung bases identified 5 individuals with pulmonary nodules who required CT follow-up; however, no lung malignancies were identified. One individual showed a pulmonary arteriovenous malformation and required a CT pulmonary angiogram, a subsequent formal angiography, and treatment of the malformation. Colonoscopy was performed in 3 individuals who showed possible bowel abnormalities on MDCT; one person required further CT follow-up. Living donor nephrectomy is becoming increasingly prevalent due to the global shortage of deceased donor organs. The accurate evaluation of the renal anatomy and vasculature of prospective donors is important for planning surgery, anticipating intra­operative difficulties, and preventing postoperative complications.9,10 Multidetector computed tomo­graphy is the criterion standard imaging modality for accurately evaluating prospective kidney donors due to its ability to define renal collecting system, vasculature, and anatomic variations.11 Furthermore, CT arteriography and urography are less invasive than formal arteriography and urography. Herein, we investigated the prevalence of incidental findings on preoperative CT in healthy prospective renal donors. Our main finding is that a variety of incidentally detected lesions of moderate to high importance were detected in the liver, kidney, pancreas, lung, reproductive organs, and gastro­intestinal systems in this healthy subject cohort. Although CT is an efficient, minimally invasive and highly accurate diagnostic modality, it may lead to a delay or increase in exclusion rates for living donor nephrectomy due to increased detection of pathologic findings that are not clinically significant.12 The prevalence and impact of incidental clinical findings (incidentalomas) on CT in an asymptomatic, young, and healthy population have so far been poorly described. Overall, we identified at least 1 incidental finding in 61% of our population. Tan and associates investigated the prevalence of incidental findings on preoperative abdominal CT in 1597 prospective renal donors.7 Their findings were consistent with ours, with 75% of prospective donors having at least 1 incidental finding on CT arteriography and 1.1% requiring additional investigations and follow-up. The prevalence of malignancy in their cohort was 0.1% (3/1597), which is also consistent with the prevalence of 0.3% (1/375) noted in our study. Maizlin and associates also investigated incidental extrarenal findings in 175 prospective renal donors and noted a prevalence of 40.6% (71/175).13 Findings were categorized as “high clinical importance” in 18 potential donors (10.3%) with additional investigations required in 49 potential donors (28%).13 Furthermore, highly and moderately significant extrarenal findings required an additional overall cost of $6137 (mean $35.1 per each case of all screened subjects).13 In our study, additional radiologic investigations were performed in 25 individuals: 11 requiring US, 6 requiring MRI, and 8 requiring CT. One person required radiologic intervention for a pulmonary arteriovenous mal­formation. Our findings showed that there is approximately a 42% chance of an incidental finding being identified in an MDCT during renal donor assessment. Of these incidental findings, 7.5% will require further investigations. This information will be useful in counseling donors on this potential source of harm, in advance of renal donor assessment. The ability of MDCT to detect and characterize unforeseen extrarenal findings of low, medium, and high importance during the donor assessment process inevitably increases clinician workload, increases anxiety in the potential donor, and increases imaging costs.12 Lerman and associates showed significantly elevated anxiety in individuals who were negative for malignancy during a breast cancer screening program.14 Berlin and colleagues also emphasized legal and ethical implications that should be considered when exposing a healthy population to intravenous contrast and significant radiation during conventional CT surveillance programs.15 Therefore, the psychologic effects associated with potential follow-up and treatment of extrarenal findings should be considered and relayed to potential donors during the initial stages of the donor assessment process.16 Conversely, serendipitous findings on CT may also lead to early diagnosis and treatment of curable diseases in asymptomatic subjects, thereby improving long-term clinical outcomes.7 In the present study, 1 potential donor presented with an incidental asymptomatic bladder tumor that was emergently treated with a minimally invasive endourologic procedure. The present study has limitations. It is a single-center, retrospective analysis of a prospectively maintained database. However, comprehensive follow-up of all candidates who underwent MDCT during the donor assessment process over a prolonged period was undertaken, and none were lost to follow-up. Multidetector computed tomography is the current criterion standard imaging modality for accurately evaluating the anatomy and vasculature of prospective kidney donors. During the donor assessment process, MDCT also frequently detects clinically relevant findings that may impact donation, increase anxiety in potential donors, and lead to higher donor exclusion rates. Potential donors undergoing assessment with MDCT for living donor nephrectomy should be counseled on the medical implications of incidentally detected lesions during the assessment process. Brook NR, Nicholson ML. An audit over 2 years’ practice of open and laparoscopic live-donor nephrectomy at renal transplant centres in the UK and Ireland. BJU Int. 2004;93(7):1027-1031. Connaughton DM, Harmon G, Cooney A, et al. The Irish living kidney donor program - why potential donors do not proceed to live kidney donation? Clin Transplant. 2016;30(1):17-25. Doxiadis, II, Smits JM, Persijn GG, Frei U, Claas FH. It takes six to boogie: allocating cadaver kidneys in Eurotransplant. Transplantation. 2004;77(4):615-617. Jacobs SC, Cho E, Dunkin BJ, et al. Laparoscopic live donor nephrectomy: the University of Maryland 3-year experience. J Urol. 2000;164(5):1494-1499. Zhang J, Hu X, Wang W, Li X, Hang Y, Zhang X. Role of multidetector-row computed tomography in evaluation of living renal donors. Transplant Proc. 2010;42(9):3433-3436. Tan N, Charoensak A, Ajwichai K, et al. Prevalence of incidental findings on abdominal computed tomography angiograms on prospective renal donors. Transplantation. 2015;99(6):1203-1207. Raman SS, Pojchamarnwiputh S, Muangsomboon K, Schulam PG, Gritsch HA, Lu DS. Utility of 16-MDCT angiography for comprehensive preoperative vascular evaluation of laparoscopic renal donors. AJR Am J Roentgenol. 2006;186(6):1630-1638. Kawamoto S, Fishman EK. MDCT angiography of living laparoscopic renal donors. Abdom Imaging. 2006;31(3):361-373. Kawamoto S, Montgomery RA, Lawler LP, Horton KM, Fishman EK. Multidetector CT angiography for preoperative evaluation of living laparoscopic kidney donors. AJR Am J Roentgenol. 2003;180(6):1633-1638. Strang AM, Lockhart ME, Kenney PJ, et al. Computerized tomographic angiography for renal donor evaluation leads to a higher exclusion rate. J Urol. 2007;177(5):1826-1829. Maizlin ZV, Barnard SA, Gourlay WA, Brown JA. Economic and ethical impact of extrarenal findings on potential living kidney donor assessment with computed tomography angiography. Transpl Int. 2007;20(4):338-342. Lerman C, Trock B, Rimer BK, Jepson C, Brody D, Boyce A. Psychological side effects of breast cancer screening. Health Psychol. 1991;10(4):259-267. Berlin L. Should whole-body CT screening be performed with contrast media? AJR Am J Roentgenol. 2003;180(2):323-325. Pauker SG, Kopelman RI. Trapped by an incidental finding. N Engl J Med. 1992;326(1):40-43. Olsburgh J, Thomas K, Wong K, et al. Incidental renal stones in potential live kidney donors: prevalence, assessment and donation, including role of ex vivo ureteroscopy. BJU Int. 2013;111(5):784-792. Strang AM, Lockhart ME, Amling CL, Kolettis PN, Burns JR. Living renal donor allograft lithiasis: a review of stone related morbidity in donors and recipients. J Urol. 2008;179(3):832-836. Delmonico F, Council of the Transplantation S. A Report of the Amsterdam Forum on the Care of the Live Kidney Donor: Data and Medical Guidelines. Transplantation. 2005;79(6 Suppl):S53-66. Andrews PA, Burnapp L, Manas D, et al. Summary of the British Transplantation Society/Renal Association U.K. guidelines for living donor kidney transplantation. Transplantation. 2012;93(7):666-673. Platt JF, Ellis JH, Korobkin M, Reige KA, Konnak JW, Leichtman AB. Potential renal donors: comparison of conventional imaging with helical CT. Radiology. 1996;198(2):419-423. Israel GM, Bosniak MA. Follow-up CT of moderately complex cystic lesions of the kidney (Bosniak category IIF). AJR Am J Roentgenol. 2003;181(3):627-633.